Jewelry is something we all have lying around - whether it is ours, our mother's, or even our grandmother's. But unless you bought it yourself, how do you know what it is supposed to be worth? And even then, how do you know you bought it at a fair price? Many people don't know what to look for when buying (or selling) jewelry, so we contacted a local jeweler - M. Rahal Jewelers - for some good advice on how to avoid being ripped off. Mounir Rahal explained buying jewelry to me with this analogy: Shopping for jewelry is very similar to shopping for a home or choosing a restaurant to dine at. You could spend $5 on a happy meal, but there will be no long-term satisfaction. It will not be good for you and you'll have issues with the decision later. Whereas if you bought a more expensive dinner (as is with a more expensive piece of jewelry), which uses better ingredients that are better for you, it will have better long-term effects, it will be more rewarding, and require less upkeep. 1. Best quality product for your money. 2. How to stretch their dollar with the products presented that put the piece together. 3. Trust the person you are buying the nice jewelry from. 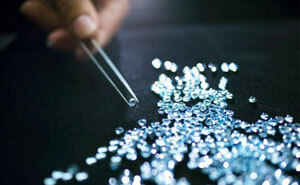 The saying is, "if you don't know your jewels, at least know your jeweler." So who are the best jewelers to know? The local ones, like M. Rahal Jewelers. 4. Looking for Diamonds? Rahal says look for the following things: Diamond prices are not based on size alone; Color, clarity, cut, and shape are just as important. One stone could be much more expensive because there are fewer imperfections, it is ideally proportioned and the stone is colorless. It is best to buy a loose stone, this way no inclusions can be hidden under prongs. In today's market many customers request certified stones. 5. Looking for Gold? Rahal explained to look for the karat mark (10k, 14k, 18k, 22k or platinum). Price of gold is based on the content of the metal. 1. An honest explanation of price you are given. 2. Get details on the "pay per gram" price that determines how much your gold is worth. This price is based on the Gold Market which is constantly changing. The average of a gold product is $25 per penny weight, which equals about $1,000 per oz. 3. Which market are you selling to? Determine if it is a "buy to resell" or "buy to breakdown" market. Special thanks to M. Rahal Jewelers for contributing their expertise. If you don't know what the jewelry you have is worth, we recommend checking with Rahal at M. Rahal Jewelers for an honest appraisal!